Last night I went for a little shopping spree. It all started when I wandered to KENZIE&CO and found myself a cute skirt. Then I needed a top for the skirt and went to look for one. In Thimbles I didn't find the top, but instead I found this adorably edgy one-piece. Last stop I wandered was Kyoot and the last moments of their annual sale. There I found lots of stuff (I will most likely blog the rest later), including the top to wear with the skirt. Well the top (jacket) wasn't the type I initially had been thinking I would get. 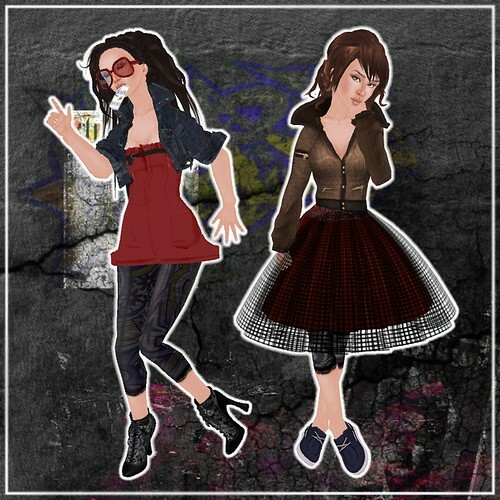 These two looks I put together included some of my new purchases, some older pieces from my inventory, more stuff from [ bubble ] and the subscribers group gift shoes from A-BOMB. And the both looks, in my opinion, kind of rock and roll in very different ways. Which one is your favorite? 4 comments for "The rock and the roll"